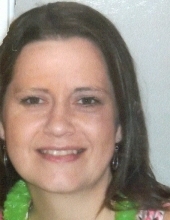 Robin Nicole Coley Nugent Goodson, 44 year old resident of the Beautancus community, Mount Olive, passed away Friday night, March 15, 2019, at Vidant Medical Center. She is survived by a son, Tyler Nugent, of the home; a daughter, Elysa Goodson of the home; her mother, Becky Foss of Mount Olive; two sisters, Amber Odom of Mount Olive and Angie Coley of Greenville; a grandson, Noah Alexander Mata, and another on the way. She was preceded in death by a daughter, Nealy Goodson; and her father, William Douglas Coley. Robin's life will be remembered in a service Tuesday, March 19, at 7 p.m. at Tyndall Funeral Home with visitation to follow. Family and friends are also being received at 741 Maysville School Road, Mount Olive. In lieu of flowers, contributions toward funeral expenses would be most appreciated. To send flowers or a remembrance gift to the family of Robin Coley Goodson, please visit our Tribute Store. "Email Address" would like to share the life celebration of Robin Coley Goodson. Click on the "link" to go to share a favorite memory or leave a condolence message for the family.